Remember I had dinner with friends after having been sent some cookbooks? I know it was a while ago and it has taken me a lot longer than planned to write about the final recipe, but better late than never. The third and final dish I tried from The Free Range Cook was Roasted Beet and Rocket Salad and I'll definitely be making it again, especially once the beetroot in my veg patch is ready for eating. For years I thought I hated beetroot. There aren't many foods I won't eat and most I keep trying with again every now and then to see if my taste buds have changed, sometimes that works as in the case of beetroot (the supposed pleasures of celery still elude me to this day though). Well to be honest, I guess it wasn't a case of my taste buds changing, more the fact that after having only ever eaten pickled beets, I went to Finland and was served a vegetable stew that had the most amazing tasting beetroot in it. I was converted. Now I have it often, still never pickled though! Preheat your oven to 180C/Gas5. Place the beetroot wedges in a large roasting tin lined with baking paper and mix with the first measure of oil, the sugar, vinegar and season with salt and pepper to taste. Roast for 45 minutes, until tender. Allow to cool in the roasting dish. Toss the salad leaves with the sec ond measure of oil and lemon juice and place on a large serving platter or other shallow dish. Top with roasted beets and scatter the almonds and crumbled feta on top. How delicious looking! I love the combination of feta and beetroot. The colours just scream "fresh" and "delicious"
Mmmmmmm, lovely! My mouth is watering looking at that. I am planning a similar combination in filo. Looks and sounds so good. 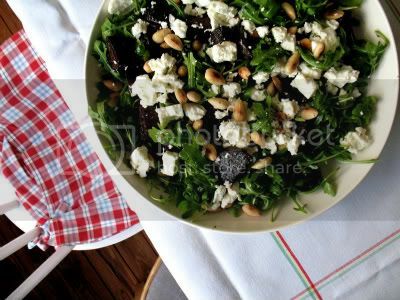 I love feta or blue cheese with beetroot!